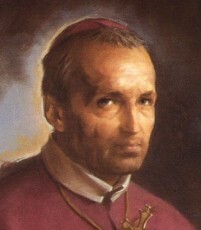 St. Alphonsus was born in Naples in 1696. He was the first born of seven, belonging to the Neapolitan Nobility. Alphonsus went to law school at the age of sixteen, and became a very well known lawyer. He was thinking of leaving the profession, and was quoted as saying, “our profession is too full of difficulties and dangers, leaving us to lead an unhappy life and risk dying any unhappy death”. Because he wanted to secure the salvation of his soul, he quit his career. He was twenty-seven at the time he quit. Against his father’s wishes, he began his seminary studies in preparation for the Priesthood at the Oratory of St. Phillip Neri. He was ordained a Priest at the age of 30, living his first years as a priest with the homeless and marginalized youth in Naples. He actually founded the “Evening Chapels” which were managed by the young people themselves. These Evening Chapels were Centers of prayer, piety, preaching, community, social activities, and education in the faith. By the end of his life, there were 72 of these chapels with over 10,000 in active participants. He had a profound gift to preach his sermons in ways that converted those who were alienated from their faith. He suffered from scruples (an unwarranted fear that something is a sin which, as a matter of fact, is not) much of his adult life, and felt guilt about ‘minor’ issues related to sin. He felt it was a blessing though, or at least in the beginning of his conversion as it cleansed the soul and at the same time made him careful. In 1732 St. Alphonsus founded the Congregation of the Most Holy Redeemer. Sister Maria Celeste Crostarosa told him that it had been revealed to her that he was the one God had chosen to found the Congregation. The primary goal of the congregation was to preach and teach in the slums of the cities and poor places. His congregation also fought “Jansenism” which was a heresy that denied humans free will and barred many Catholics from receiving the Eucharist. He dedicated himself entirely to this mission, and Sister Maria Celeste founded a companion congregation of Nuns that worked with him. St. Alphonsus was consecrated Bishop in 1762. He tried to refuse accepting the appointment, using his age and infirmities as arguments against his consecration. During this time however, he wrote sermons, books, and articles to encourage devotion to the Blessed Sacrament and the Blessed Virgin Mary. He was allowed to retire from his office and went to live in the Redemptorist Community he founded, in Italy. He passed away there on August 1st, 1787. He was beatified in 1816, and canonized in 1839. St. Alphonsus was an influential lawyer and realized that if he continued down that path with no concern for his soul, he could jeopardize his salvation. Wanting to secure it, he left his profession and served the Church as a Priest and then Bishop. He even went on and founded the Redemptorists, the Congregation of the Most Holy Redeemer. Serving the poorest of the poor in the inner cities he found peace and happiness in being a servant. This was quite a contrast from his life as a prominent lawyer. He shows us, as many before him; securing our salvation and finding true peace in this world, comes only from reaching outside of ourselves and serving others. When done in accordance with the Divine Will of God, we find peace.